It is a powerful reinforcement of McCain’s own political brand: tough, reform-minded, willing to break with his own party for the right cause. And it’s true that her high-profile crusade against corruption and complacency in her own state party over the past few years has made Palin the Frank Serpico of Alaska politics: she publicly ratted out her state party chairman; whupped the good old boys’ network, as she likes to put it, in a gubernatorial primary; and fought a general election in which the scandal-stained state GOP didn’t lift a finger on her behalf. She won only because she had the enthusiastic backing of independents and grass-roots activists. 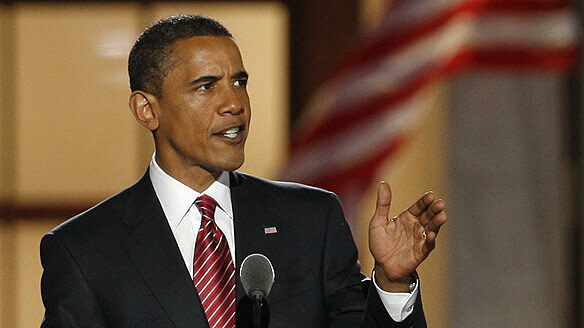 Barack Obama’s acceptance speech tonight wasn’t what people have come to expect from a Barack Obama speech. It wasn’t filled with lofty rhetoric or grand cadences. It did not induce tears or euphoria. It didn’t have the forced, kitschy call and response tropes — “and that’s the change we need!” — that defaced nearly every other major speech at this convention. At 43 minutes, nailing his dismount at 10:53 pm, it wasn’t even very long. It was lean, efficient, practical and very very tough. “I know there are those who dismiss such beliefs as happy talk. They claim that our insistence on something larger, something firmer and more honest in our public life is just a Trojan Horse for higher taxes and the abandonment of traditional values. And that’s to be expected. Because if you don’t have any fresh ideas, then you use stale tactics to scare the voters. If you don’t have a record to run on, then you paint your opponent as someone people should run from. And you know what — it’s worked before. Because it feeds into the cynicism we all have about government. When Washington doesn’t work, all its promises seem empty. If your hopes have been dashed again and again, then it’s best to stop hoping, and settle for what you already know. A record crowd of 84,000 witnessed Barack Obama accept his Presidential nomination. The corporate media built up the expectations for Barack Obama’s speech tonight to a point at which the mainstream pundits were sharpening their scalping knives to proclaim that he didn’t meet those expectations. But once again the media blowhards underestimated Barack Obama’s talent, his oratorical skills, and his heart. What impresses me the most about Barack Obama is his grasp of the engine of history. He knows that FDR’s New Deal was not passed from on high but was an expression of years of arduous organizing by ordinary workers, struggling to form successful industrial unions for the first time in this country.